Ever think the world is so vast, and feel like we’re all hundreds of kilometres from each other? Sometimes I feel like that, and then something like this happens. We were engaged to manage a deceased estate in a small rural town. The old house was packed with antiques, curios and historic items, and after a busy couple of days we were down to the last few items left in the overstuffed garage. Among these last bits and pieces was an old treadle sewing machine, which we had assumed was a Singer. But when we folded the machine out we found it was labelled “Selpam”. Selpam? Who ever heard of that brand? A bit of research and the answer was uncovered. I grew up in Melbourne, and there were a number of Maples Stores, including one just near me. In fact I remember going with my Dad when he bought me my first sewing machine at the Maples store in Prahran; not a treadle though, I’m not that old! It turns out that Selpam was Maples’ home-brand. 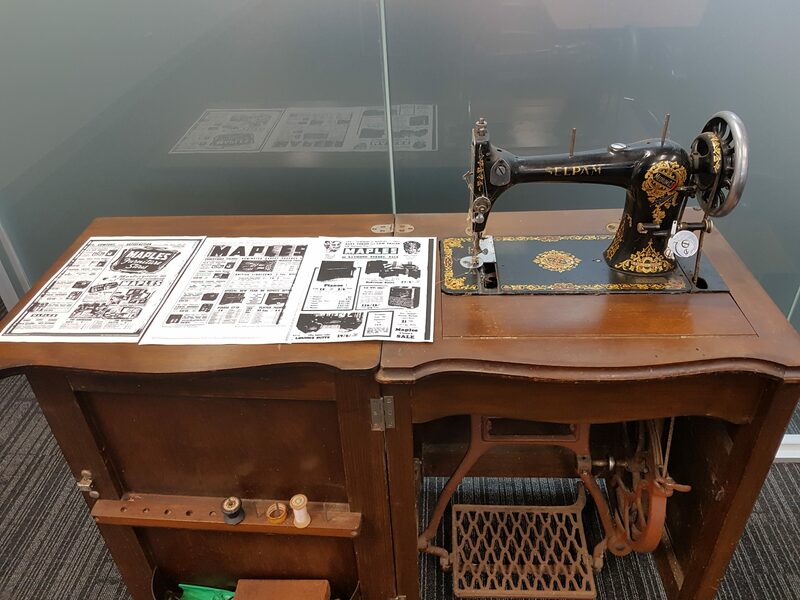 We were able to track down original advertising that shows Maples sold Selpam treadle cabinet sewing machines through the 1940’s. In 1940 they cost £18/18’. And people associated with the original stores were intrigued to realise that a machine sold was still going strong, bought the machine, and proudly display this piece of history in the foyer of their business. The world isn’t such a big place!